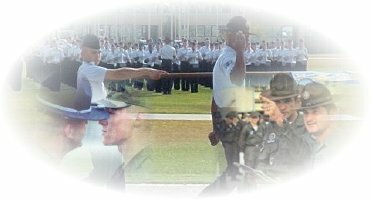 The command is To the Rear, MARCH, given as the heel of the right foot strikes the ground. 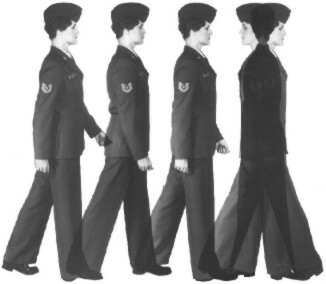 On the command MARCH, the airman takes a 12-inch step with the left foot, placing it in front of and in line with the right foot and distributes the weight of the body on the balls of both feet. Then pivot on the balls of both feet, turning 180 degrees to the right, and take a 12-inch step with the left foot in the new direction, with coordinated armswing, before taking a full 24-inch step with the right foot. While pivoting, do not force the body up or lean forward. The pivot takes a full count, and the arm swing is suspended to the sides as the weight of the body comes forward while executing the pivot, as if at the position of attention.